In our search for a common hobby we have arrived at the horses, more specifically the miniature horses. After a lot of research regarding origin, color … we had to make yet another work, so we put the step to buy a horse. This was Tybee. 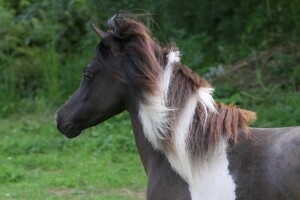 Tybee was a naughty black pinto filly and we were thrilled to have her. Unfortunately, after a few weeks Tybee unexpectedly deceased. We were devastated. Now what? After a visit to a farm in Holland, we decided not to give up and we bought two pregnant mares. And what two! 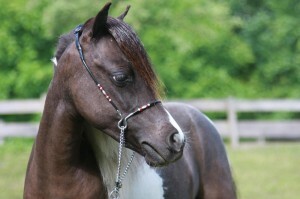 The mom of our Tybee, and a daughter of the famous stallion “Little Kings Black Velvet”. The name of our stable we didn’t have doubt about, a tribute to our Tybee, namely “TyBees”. When we were thinking about it, everything fell into place. If you take the first letters of our names T and B (Tamara and Brecht) it becomes TyBee. Our daughters Anouk (American) and Marit (Miniatures) are in turn nicely processed. It had to be! 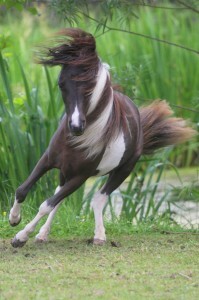 Our concern in the first place, is to breed and love our beautiful miniature horses.